Home / Blog / What are the Causes of Dog Bites and Can They be Prevented? It can be very easy to place blame on a dog when it bites someone. But, did you know that blame can be placed on the dog’s owner and even the victim? It all depends on how the owner handles the dog and how the victim approached the dog that wound up biting them. More than 4.5 million dog bite incidents occur each year across the United States, making it a widespread problem that doesn’t seem as if it will go away anytime soon. Many of these incidents lead to serious injuries that require therapy, reconstructive surgery, and other invasive treatment for the victim. Let’s look at some common causes of dog bites and how they can be prevented in today’s post. Many dogs who bite people tend to do so because they are sick or have some type of illness. Dogs might snap when ill at children who approach them too quickly or anyone else that might cross their path. An ill dog can be irritable and bothered by the slightest inconvenience or other issue that crops up around them. That’s why it’s best to never approach an unfamiliar dog, especially if there is no owner in sight. Dogs are not fearless, not in the least bit. Because of this, many dogs will bite humans out of fear for their own safety. Dogs are able to sense when humans are bad or have abused other animals. They just tend to know these things. This could be a reason why a dog bites a human. 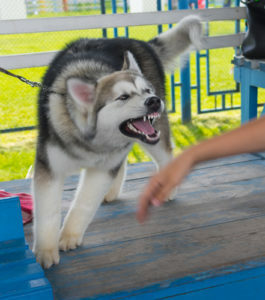 Dogs will bite people who trespass on their property or other animals who threaten them in order to stay safe. Sadly, some dogs are trained to aggressively protect their territory by their owners. This leads them to bite almost without warning in some instances where an unfamiliar person enters their territory. A dog can feel territorial over their puppies, their owner, their home, their food and their water supply. A dog might easily explode if it feels as if its territory is being invaded, even if it is someone picking up their food bowl to move it somewhere else. There are people out there who simply like to get a rise out of dogs by antagonizing them. Someone might walk by a yard with a fence, notice a dog outside running around, and approach the fence to antagonize or torment the dog. This can lead to the dog attacking the person or biting them through the fence. In order to prevent dog bites it’s important to always ask a dog’s owner if you can approach and pet the dog before doing so. The owner might tell you it’s best not to pet the dog. Or, the owner might give you the green light. Children should be taught to never rush towards a dog but only to approach calmly and carefully. It’s also best to avoid unknown dogs when out for a walk with your dog or even when by yourself. Did you or a loved one sustain serious injuries due to a dog bite in Pennsylvania? Don’t let the medical bills pile up while you wait for the negligent party or their insurance company to do the right thing. Right now, you need an aggressive personal injury attorney on your side, fighting to get you the compensation you need, want, and deserve. The skilled attorneys at Purchase, George & Murphey, P.C. represent clients injured because of dog bites in Erie, Fairview, Meadville and throughout Pennsylvania. Contact us at 814-833-7100 or email us to schedule a free consultation about your case. We have an office conveniently located at 2525 W 26th St. Erie, PA 16506 as well as offices in Meadville and North East, PA.